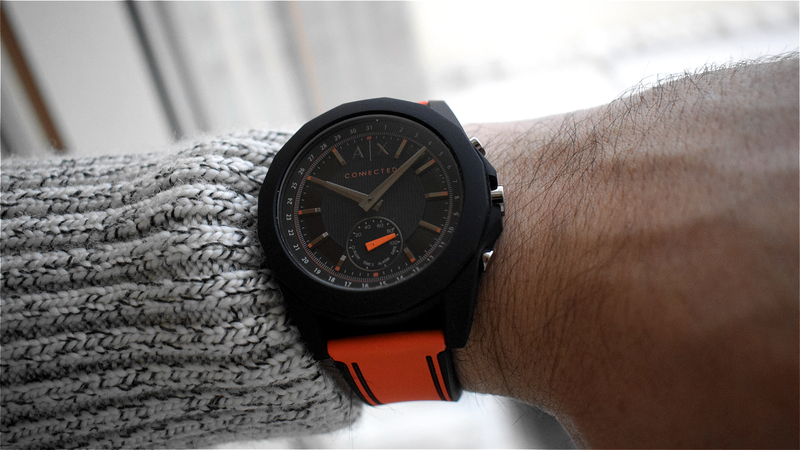 Another Fossil partner is getting into wearables at CES 2017, with Armani Exchange debuting its first hybrid smartwatch. The AX Connected is the first Fossil Group wearable with a silicone case, giving it a more rugged feel than others in the line up. However even with the 44mm case, it didn't feel too overbearing when we tried it on. The AX is available in four colours: white, black, blue and orange. As for its smarts, it brings onboard many of the same features we've seen across the rest of the Fossil line including step and sleep tracking, smartphone notifications, and the ability to take selfies and control music playback using the pushers. There's a sub-dial, used in conjunction with the clock hands, to help you see your set alarm, second time zone, the date, and any incoming notifications. This also provides a progress gauge for your daily activity goal. The watch is water resistant to 5ATM, making this a good one for surviving the elements (or just a bit of swimming), while the coin cell battery will last for up to six months, depending on usage. We only got to play with a test unit, so we couldn't really put it through many of its paces, but we really like the look of the AX and we'll certainly be getting one in for review as soon as possible. The Armani Exchange Connected will be available from February, marking the ninth of Fossil's owned/licensed brands to move into the wearables market. Pricing is yet to be announced but expect to hear something very soon.